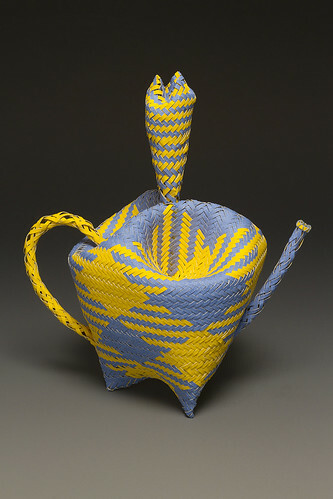 While perusing the list of artists whose work will be seen in the upcoming Pulp Culture: Paper is the Medium exhibit at the Morris Museum in Morristown, New Jersey, I was stopped in my tracks by remarkable contemporary baskets woven by Dorothy McGuinness of Washington state. Nearly thirty years ago, Dorothy took a basket weaving class in Seattle and was hooked... that class led to nearly 200 more. 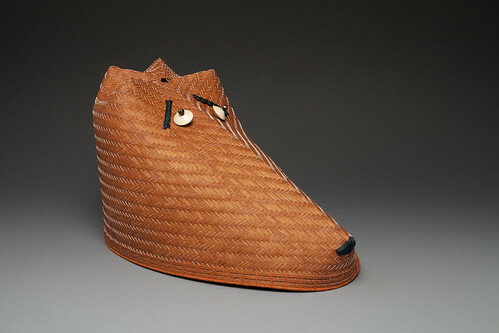 She has studied with American Indian artists, traditional American basket makers, and with Japanese bamboo basket maker Jiro Yonezawa. 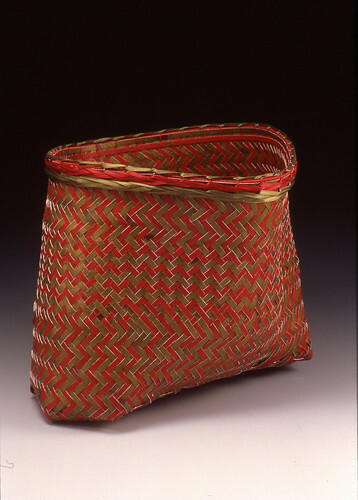 What is especially unusual about Dorothy's baskets is her material of choice. Realizing she wasn't interested in taking the time to learn to properly prepare bamboo, and after attending a seminar on weaving with paper, watercolor paper became her medium. Dorothy now works with it exclusively. She relies on a pasta maker to cut paper sheets into 1/8 inch (3mm) strips and paints them with acrylics. 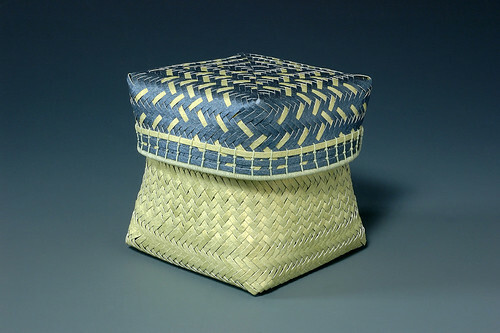 Dorothy began using paper to do diagonal twills of Japanese basketry. 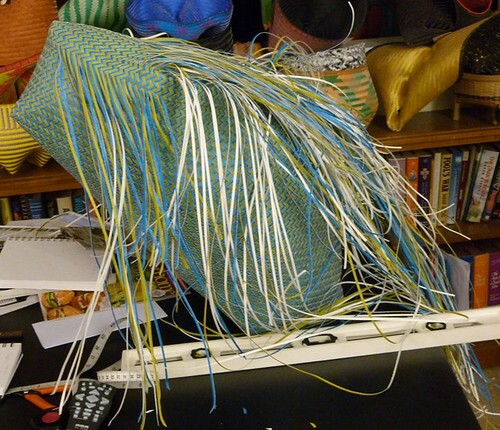 She says: I’ve explored coiling, twining, plaiting, mad weave, rib style baskets and everything in between. But diagonal twills are what I enjoy working with the best. 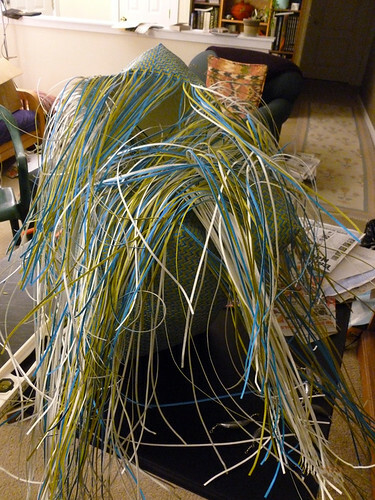 Those of us who quill with one narrow paper strip at a time will marvel at these in-progress shots of Dorothy's Vault basket - just look at the complexity of the process! 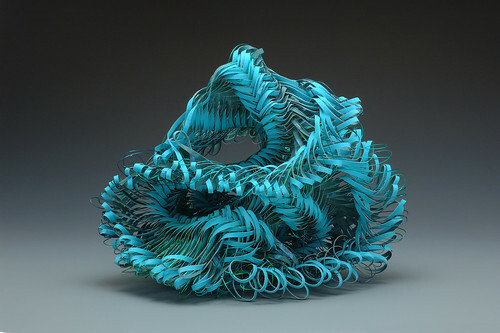 She continually experiments with color, pattern, and form to achieve a variety of sculptural shapes. 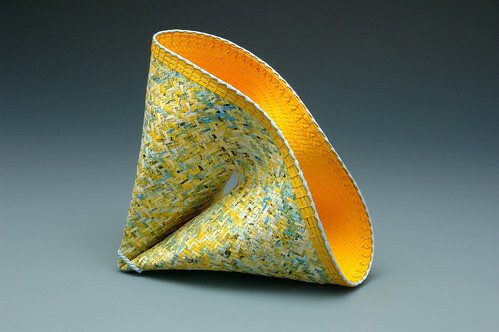 A research scientist, Dorothy enjoys incorporating her love of math and geometry into the art. 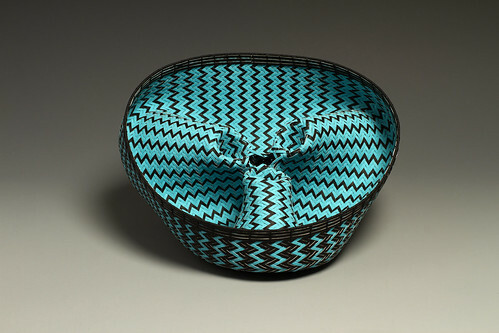 I'm looking forward to seeing her work in person next month... Out Burst and Electric Blue are just two of several baskets made by Dorothy that will be in the show. 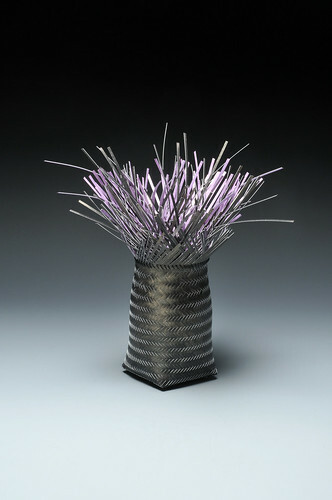 The exhibit dates are September 21 - December 7 and it will feature the work of nearly fifty artists. I'm pleased that a few pieces of my paper jewelry are included too - more about them in a future post. 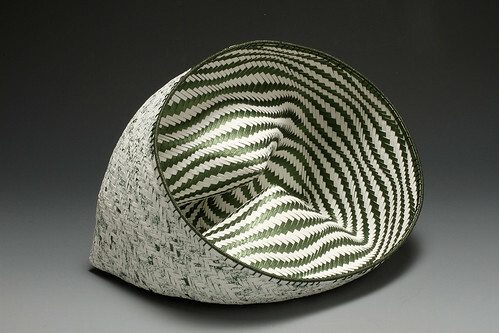 See many more examples of Dorothy's baskets on her website and Flickr. Absolutely stunning!! Remarkable that she hand paints the strips and uses them. Each one is a masterpiece. I can't even find the words to say how amazing this is! Now THAT is patience! Thanks for the link, Suman, I wasn't aware of that excellent blog! Wauw - what a Work - I thought I was patient - but this is amazing.